By this point in time Nintendo has cleanly put the Wii U in the rearview mirror; virtually all support has transferred over to the Switch from both first- and third-parties, and few are looking back. 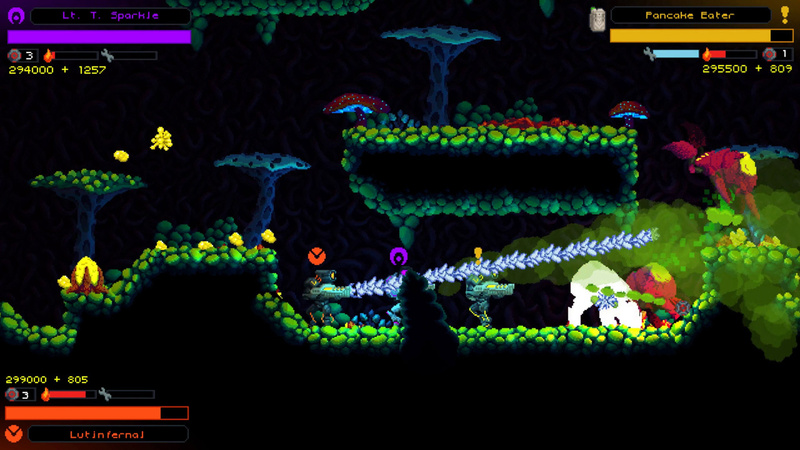 Even so, some games are still trickling out on the Wii U eShop; one such release is Hive Jump. 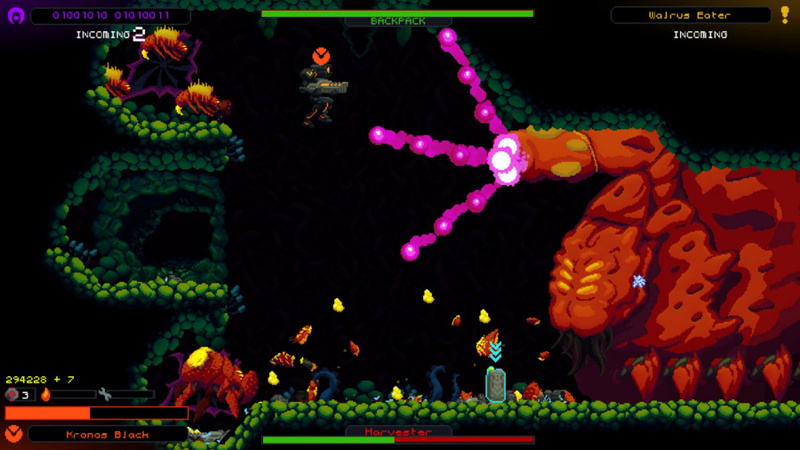 Though Hive Jump presents some interesting ideas, it’s marred by a series of technical setbacks and gameplay issues that hold it back from being something truly exceptional. 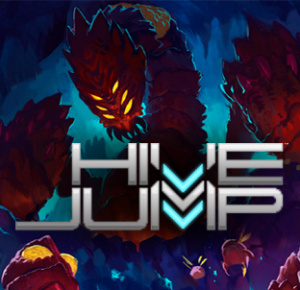 The premise of Hive Jump is simple and rather forgettable. Humanity is at war with an evil alien race, and it’s up to a team of space marines — the J.U.M.P Corps — to outgun the alien menace in an intergalactic war. Though Hive Jump doesn’t get any points for a riveting story or gripping characters, it’s clear that the story is simply here to serve the purpose of providing context, and in that sense it fulfills its job well. There are a few game modes here - a campaign, an arcade mode, and a challenge mode. Those latter two are exactly what they sound like; arcade mode strips away all superfluous elements to give you a good pick up and play experience while challenge mode will task you with missions under certain objectives and restrictions. 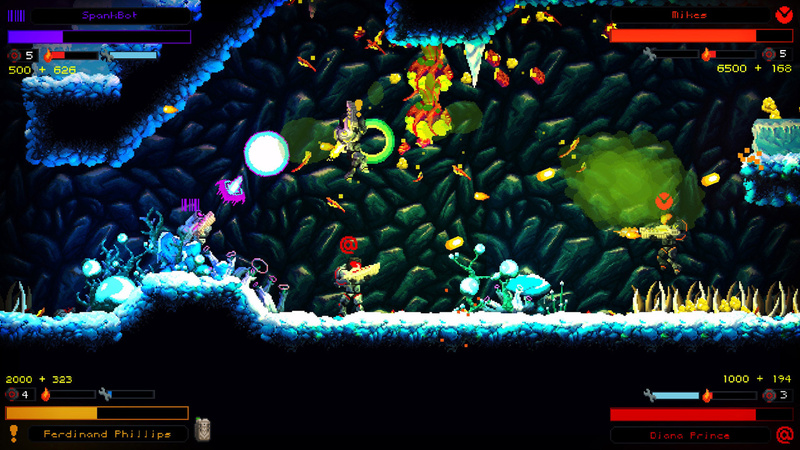 The bulk of the gameplay is found in the campaign mode, which mixes turn based SRPG elements with roguelike run ‘n’ gun action. On the SRPG side you’re presented with a map that has a series of connected nodes on it, and you can spend Goo — the game’s currency — to build bases on empty nodes or fortify existing ones. Some nodes will be occupied by alien hives which you can attack once per turn, and after the turn passes some aliens will attempt to take the nearest base and succeed if it isn’t fortified properly. The strategy side is really just a small portion of the main game, however; you’ll be spending most of your time trekking deep into alien hives to take them down from the inside. You and up to three other friends (locally) will be tasked with clearing out floors of randomly generated levels that are filled with aliens, killing everything that moves and collecting all the goo that you can. Along the way you can also occasionally find challenge caves that reward you with a relic — items that upgrade things like shot speed or respawn time — or find treasure chests full of goo. And should you go down in combat you’ll take temporary control of a “backpack” your marine was carrying, which has its own health bar. Once the backpack dies it’s game over, man. All of this sounds good enough on paper, but it’s the execution that leaves something to be desired. For one thing, the SRPG elements feel awkward and tacked on; there’s not a whole lot of depth here that really necessitates strategy, and you spend so little time managing bases and resources that it’s easy to forget that this part of the game even exists. This is the kind of filler that adds little to nothing to the main game and it just serves to make Hive Jump feel like an unfocused and unfinished project. The foundation of an interesting concept is laid out here, but nothing is built to take advantage of that. Then there’s the hive jumping itself. Though the action and exploration can be fun at first, it quickly devolves to a repetitive slog that fails to provide a satisfying gameplay hook that keeps players coming back. Adding in a friend or two helps liven it up a little more, but that doesn’t negate the core issues with the overall structure. There’s lots of déjà vu here as you find yourself running through the same environments, pumping rounds into the same spongey enemies, and collecting all this goo for upgrades that aren’t all that rewarding for the time you put in. And if, after spending ten to fifteen minutes fighting to the hive’s boss, you happen to lose the backpack and die? Well, you can just start from the top and do it all over again. 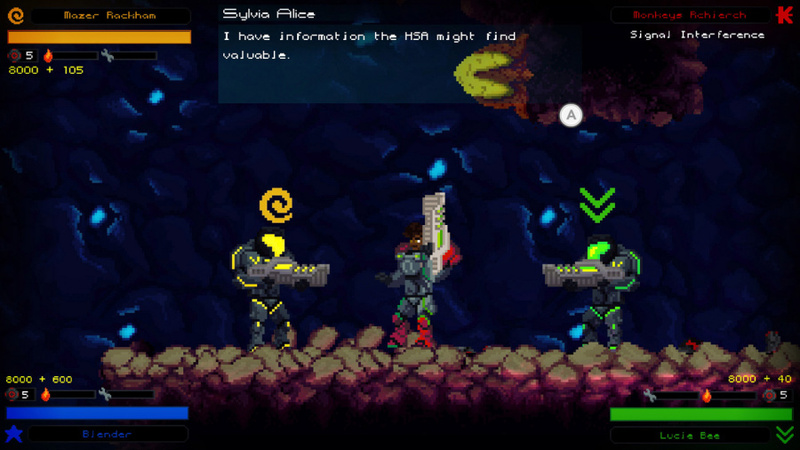 There’s a fine line that roguelikes straddle which divides mindless repetition from randomized variety, and Hive Jump unfortunately falls firmly in the camp of the former. That’s not even speaking to the disappointing quality of the performance. Hive Jump seems to target 30fps, but it fails to consistently hit this mark. This game drops frames frequently; we often found ourselves meeting a death that we didn’t actually get to witness because the image just completely skipped over displaying the last few seconds of gameplay. It's passable and certainly playable, but the framerate stutters enough that it becomes an irritation that never goes away. Throw in another player, or two, or three, and the technical problems become that much more noticeable. The main gameplay is uninspiring to start with, and these are just magnified by the sluggish performance. On the presentation front Hive Jump is competent, but it still feels lacking. The spritework is solid and the colours are bright, but the animation quality is poor and stilted. Everything looks good when standing still, but once things get moving that illusion is shattered. Similarly, the soundtrack provides a good dosage of upbeat chiptunes, but there’s nothing here that’ll have you tapping your foot or otherwise catch your attention. It’s uninvasive and it fits well with the theme of the game, and that’s all there really is to say about it. Overall, Hive Jump is a disappointing game in light of the attention and buzz it once attracted. There are the bones of an interesting concept here, but it never seems to come together quite right once everything gets rolling. Repetitive gameplay, disappointing performance and ho-hum presentation make this a game that’s 'ok' at best. We’d recommend this one only to players who are eager for a co-op action shooter for their Wii U. It does what it says on the tin, just don't expect to come away from this one wowed by the experience. Don't mean to sound harsh, but what's the point of doing a write up for an apparently mediocre game on a basically dead console when there's absolutely tons of other relevant things to write about? @Kalmaro I think it's what you say when you see someone playing a Switch. @JHDK Ahhhh, I see. Thanks! Fair play to the developers for keeping their word on bringing it to Wii U but from the sounds of it, they've put in the bare minimum of effort. The Wii U can run games like this with ease so persistent slow down when the game is already average at best means they might as well have not bothered. Hey at least they stopped reviewing RCMADIAX's trash. That said, this was a relatively high profile release for Wii U owners (at least as far as indies go), so it's only fair to them to put up a review. This game is super fun, it reminds me of the days of Metal Warriors and Cybernator on the Super NES in terms of gameplay and is basically a 2D version of Federation Force. I would give this an 8/10. For those people out there who are considering spending their money on this game, who want information about it, and end up becoming NLife regulars. I like this game quit a lot. This review is a bit harsh. @holygeez03 I'm not against the review in general. More content is better. The thing is, how many announcements and reviews on Switch and 3DS stuff are they backed up on right now? It's about priorities, and I'd understand if NL actually thought this were some great exclusive they wanted to shine a light on, but I'm just confused as to why a 5/10 (according to them) game on the WiiU eShop takes precedent over some of the things they've yet to touch on. So disappointing. And for that I gave my money years ago? And I can't even play it since it's still not available here in Europe. I played a lot of this at Xpo recently and while I may not have put in the time the writer did it was a lot of fun. @tsdenizen Well, the game has been out for nearly a month, so it's not like they dropped everything else they were doing just to get a Hive Jump review out quickly. I just want people knowing that we backers are still waiting for our Wii U keys. Dev took 2 weeks to even formally address this. Maybe next month they said. When it does work it is rather repetitive and the poor frame rate when you have more than 2 players. I can't imagine the devs will fix the constant crashing (I've only completed one level without it locking up I tweeted about it and the devs said to email, which I did 2x with no response). Seriously, the fact that this is one point away from the score on Spelunker party is a travesty! @Kalmaro That's another good one! But seriously I don't understand how most people still find that joke funny, the Wii U isn't even a bad console. Yeah I know the Wii U "failed" but constantly making fun of it feels like rubbing salt into a wound. @tsdenizen we don't know it's mediocre before the review. @Cooligan I loved my WiiU and all the 5 games I played on it. I got it only for smash brothers, I'm that big if a fan. However, when I worked at Walmart, even years after the system came out, people still think it's a Wii peripheral. @feelinsupersonic We don't know it's mediocre, period. We know Nintendo Life thinks it's mediocre, which might be really pertinent info for people who were on the fence about "Hive Jump for the Wii U" but felt the need to hold off for a month until Nintendo Life decided to jump in. I'm sure those people exist, but I also think those people aren't numerous and that there are other things the time and effort could've been spent on. I'm just not sure what a month late review of a 5/10 game on a dying system does for most people. @tsdenizen it could have been a 10. by the time the writer finds out it's a 5, the time has already been spent on it, and not writing the article is a waste. @tsdenizen also you can't say vroom in the night sky deserves more attention than hive jump. if vroom were a totally different game, it might have deserved a lot of attention. a review intends to find out whether the game is worthwhile; it's not done only about games that are known to be worthwhile beforehand. @feelinsupersonic a timely review of a terrible Switch game is far more useful than a late review of an average Wii U game. @tsdenizen I love my Wii U and still buy games for it frequently. I am one of those Wii U owners that still checks every Thursday for the possibility of new releases or virtual console releases and see which games are being discounted. Heck this past week I bought Darksiders Warmastered Edition and Stick it to the Man. As I am trying to only pick up the cream of the crop I depend on a site like NintendoLife to let me know which eshop games are good or are crap. I'll move to the Switch in six months or so, right now I am really enjoying my Wii U. @Kalmaro I don't judge the Wii U off of how well it preformed or how many people knew what it was, I judge it off of the games it has and the enjoyment I got out of it. It's why I adore my Wii U, the other problems it had are irrelevant to me. NL has a mission of reviewing every game that hits the eShop. I get your point and that is why I love NL. Pretty sure no other site bothered reviewing this but potential buyers need to know, as few as they may be. @Cooligan I look at the bigger picture, I did enjoy my WiiU but as a whole the WiiU did not work out anywhere near as hoped and I've gotten more enjoyment off my other Nintendo systems. My Switch is already my fav, and I haven't even got all my games yet. After the Switch would probably be my GameCube. Look, another Wii u review! Unexpected on this site. By the way: If it was on Switch they would give it a 8! I'm disappointed, but tbh, I noticed a lot of these issues in the trailers. It's a shame they couldn't pull it together in the end. What a trash game, this deserves maximum 3/10.